Birmingham’s premier experimental arts and music festival returns for its 15th edition. Supersonic Festival, which takes place on July 19 – 21 in the historic Birmingham Town Hall, has revealed the headline acts for its 2019 edition. 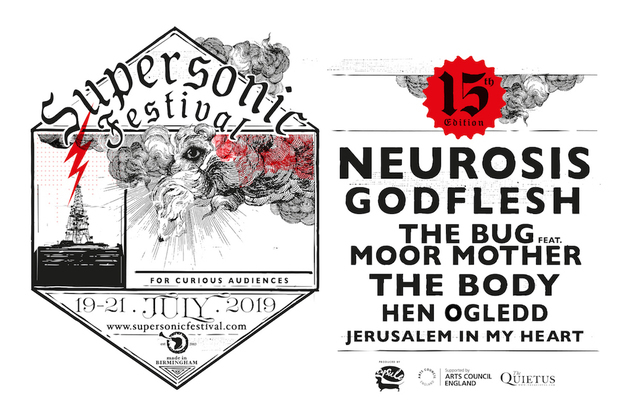 Godflesh will support headline act Neurosis, who share the bill with FACT favourites The Bug featuring Moor Mother, as well as The Body, Hen Ogledd and Jerusalem In My Heart, with more acts announced soon. Weekend tickets are available now – head over the Supersonic website for more details and re-visit The Bug’s deranged FACT mix, below.